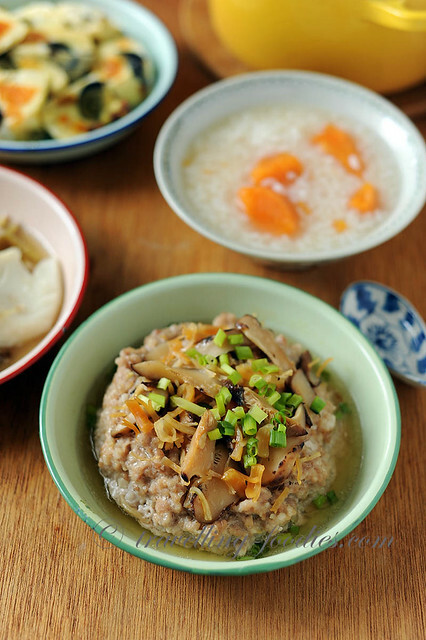 干贝北菇蒸肉饼 Steamed Minced Pork with Conpoy and Chinese Mushrooms – A really simple dish to whip up. I’d used conpoy aka dried scallops here but other ingredients like salted fish, dried shrimp would work too. I usually buy conpoy that is already broken up into pieces which costs only a fraction compared to those in whole medallions. Way cheaper but no less yummier. The trick is to soak the conpoy in just enough water to keep it submerged so that it softens nicely without leaching too much flavour into the water. The soaking water is used in the steaming as well so nothing is wasted. Take half of the reconstituted conpoy and chop finely. In a mixing bowl place all the ingredients, except sliced chinese mushrooms and the other half of the shredded conpoy, as well as 1 tbsp of the conpoy soaking liquids and give everything a good mix until a “gluey texture begins to form. Pour the mixture into a steaming dish and shape the mixture into a little dome. Using a chopstick, poke a couple of holes vertically down in various parts of the minced meat. This helps the minced meat within cook more evenly. Sprinkle the remaining shredded conpoy and sliced mushrooms on top. Steam at high heat for 12 min. Sprinkle with chopped spring onions and serve with porridge or rice. 三色蒸蛋 Tri-coloured Steamed Eggs was a dish which we ate fairly frequently when my mum was still around. Oddly, I’d not made this dish for years since her passing until I was reminded of it recently. So here it is appearing in today’s lunch spread. Season with salt, sugar as well as add the ground pepper, mushroom soaking water and sesame oil and mix well. In a metal or ceramic bowl, lay a piece of clingfilm/saran wrap to cover the surface. Use your fingers to gently nudge the thin plastic to take the shape of the bowl. Place the chopped century egg and salted egg yolk(s) at the bottom of the cling film and then pour the beaten egg mixture over it. Use a spoon to nudge the pieces around to make sure they are well spaced out. Steaming under medium high heat for 12-15 min until the egg has nicely set. Test by poke a chopstick through the middle part of the steamed egg which should come out clean. Leave the steamed egg to cool down slightly before cutting into large pieces. 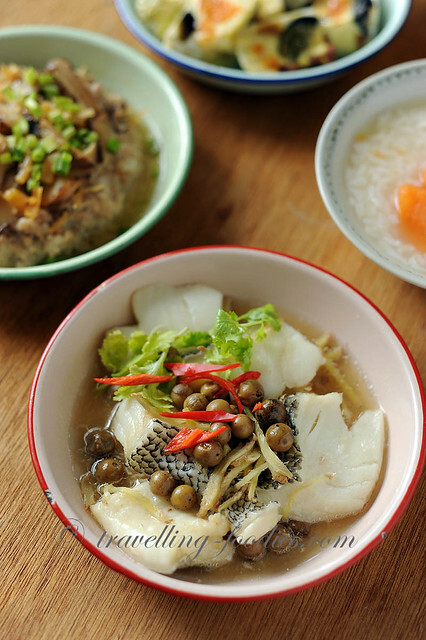 破布子蒸鳕鱼 Steamed Cod with Manjack Berries is a dish which I also whip up fairly frequently to go with porridge. Manjack berries pickled in brine are sold in glass bottles which I lug back from Taiwan. I’d seen it sold at 裕华国货 Yue Hwa at Chinatown before as well. Love how they taste and how they compliment steamed fish so beautifully. Has been a staple stockup item for me whenever I visit Taiwan. You can use practically any meaty fish which is good for steaming if cod is not your thing. seabream, snapper, seabass aka barramundi or even Chinese pomfret are all excellent choices. I’d blogged about the recipe for this simple dish here, so please click on the link for the recipe. The last thing one needs to do while the dishes are steaming is cook the porridge and I’m pretty sure everyone else can do it right? If you need help on that or any of the dishes kindly drop me a comment below. So here you have it, a simple porridge lunch that can be whipped up in no time. 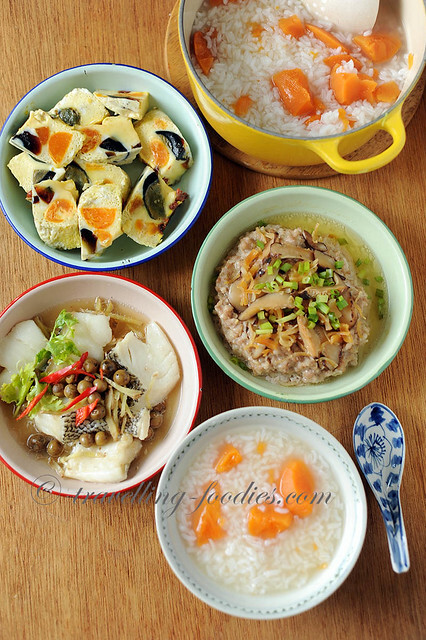 If you like to see other dishes which goes well with porridge and/or steamed rice, do leave some comments below as well! This entry was posted on September 13, 2017 by Alan (travellingfoodies). 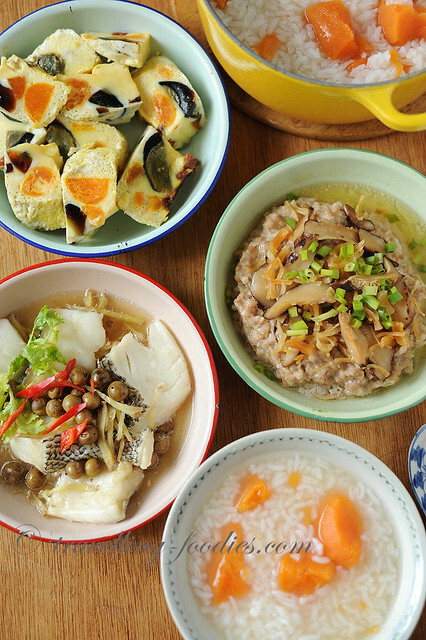 It was filed under Food, Simple Eats and was tagged with asian cooking, asian cuisine, century egg, chiliean bass, chinese cooking, chinese cuisine, chinese food, cod, congee, porridge, salted egg, sweet potatoes, teochew. can u pls do a demo or pic of how u made the tri coloured steamed eggs & brief details on how u made ur porridge? Appreciate it! Yes the eggs look good. 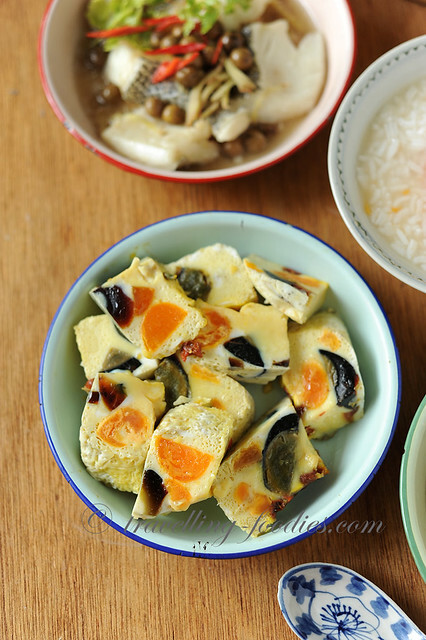 Please also do share a good hk style century egg oongee recipe too! This looks sooo homely! And codfish is my favorite.